What the devil is the difference between the Classic Army M15A4 Carbine 2009 Version and the Classic Army M15A4 Carbine "Not-2009 Version?" Well...I aim to show you in this installment of my succulent Airsoft blog. 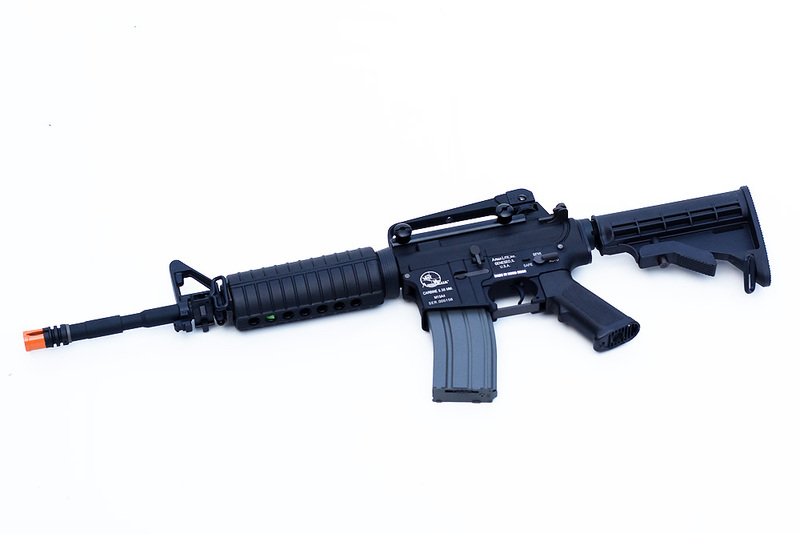 Actually, when I originally planned this review, I had a working CA M15A4 Carbine "Not-2009 Version," but since that time I had ripped it apart and not had time to put it back together due to babies being born, a full-time day job and . So I'm just going to tell you about the Not-2009 Version and show you the 2009 Version. The Not-2009 Version is not nearly as cool as the 2009 Version anyway because the 2009 Version is new, and science states that newer is pretty much always better. It's science. Let's take a look at a few pics. I'm not going to spoil their beauty by adding my annoying monologue. Just look. Drink it in. This is the Classic Army M15A4 Carbine 2009 Version. Ok. That's all the silence I can afford you. I need the spotlight back on me. 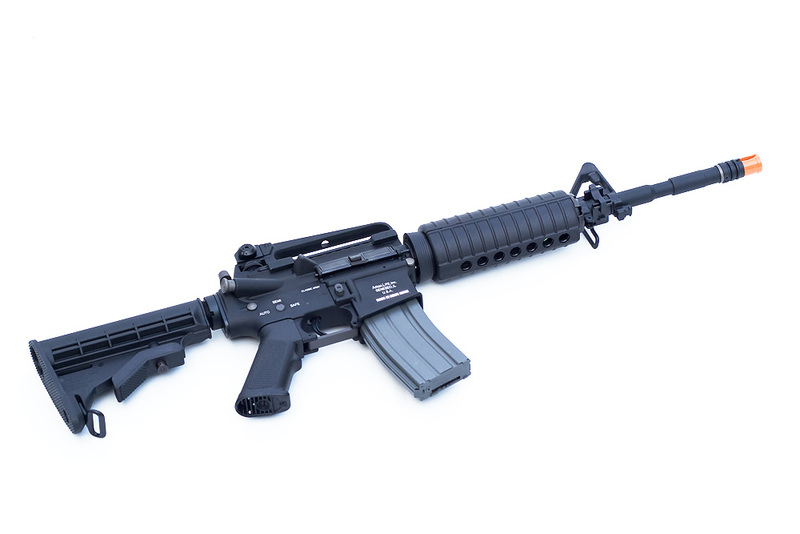 As I've stated in other blog entries, my two favorite M15A4/M4-Style AEGs are the Echo1 Platinum M4 and the Classic Army M15A4 Carbine. They're both solid rifles in their own regard, and very comparable in both features and quality. 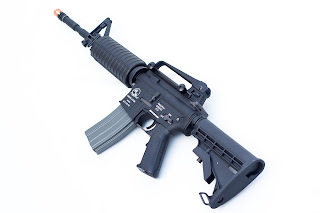 You can find my review of the Pyramyd Airsoft Echo1 Platinum M4 Review. But let's focus on the Classic Army model for a bit. These next two photos are pretty much just body shots, because let's face it, who doesn't love a good body shot? Wow. There's a lot going on in this photo. Let's work our way from the top down, starting with the carry handle. You might notice to the two large knobs at the base of the carry handle. Those loosen to allow the carry handle to be removed. Removing the carry handle exposes the rail system underneath, giving the shooter the option of mounting a set of optics to the gun. Then by all means, scope your heart out. But be prepared to be judged unfavorably, ridiculed and/or a combination of both behind your back when you bring that thing out to the field. But let's get back on track here. Going back to the image above, detailing the left side of the rifle's upper & lower receivers, you can also see the bolt release button (which actually releases the bolt cover), the charging handle (which actually pulls the bolt cover back when you wish to adjust the hop-up), and the fire selector switch (which, as you should already know, allows the shooter to toggle the rifle between safe, semi-, and full-auto firing modes). Now you may be wondering about the differences between this latest version, dubbed by Classic Army as the "2009 Version" vs. their older version of the same rifle. Remember that talk about a a functional bolt release button? No? You should probably get checked for Attention Deficit Disorder because I literally just discussed it in the last paragraph. 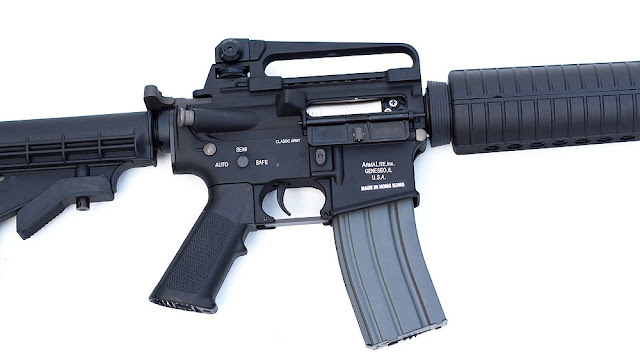 Anyway, the bolt release button was just for looks in the old version of the M15A4 Carbine whereas now, it functions. CA really went all out there. This next pic shows off the trades and stuff on the right side of the gun. 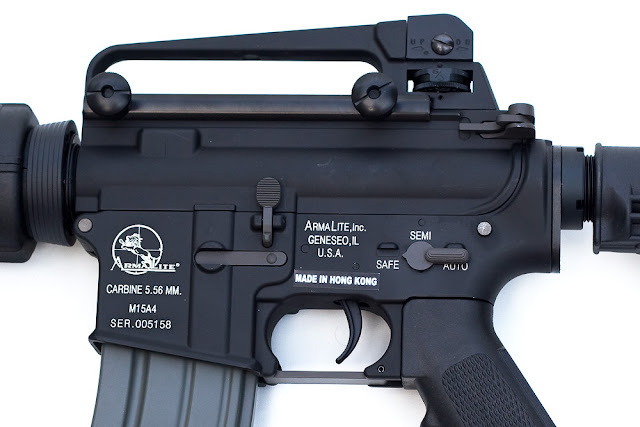 Special note: the "Made in Hong Kong" sticker located below the ArmaLite, Inc. trade writing is removable. Just like pretty much all stickers. Weird. 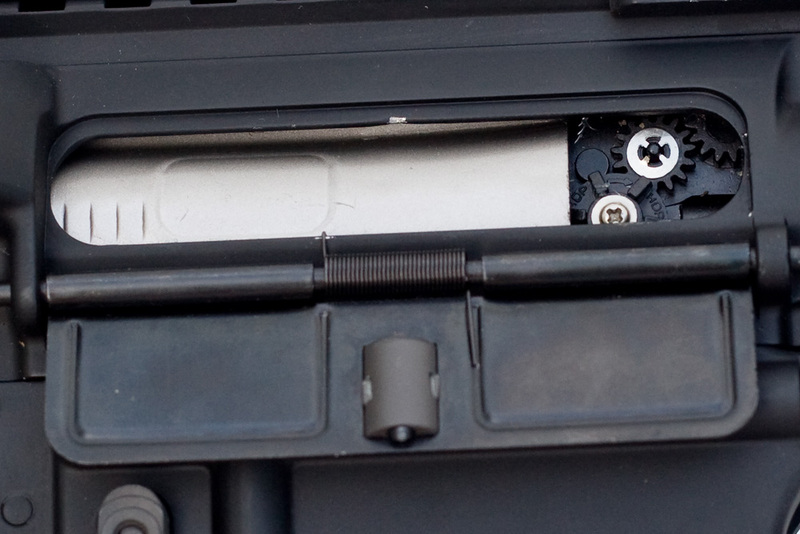 You can also see that I've gone and pull the charging handle back, exposing the hop-up dial. 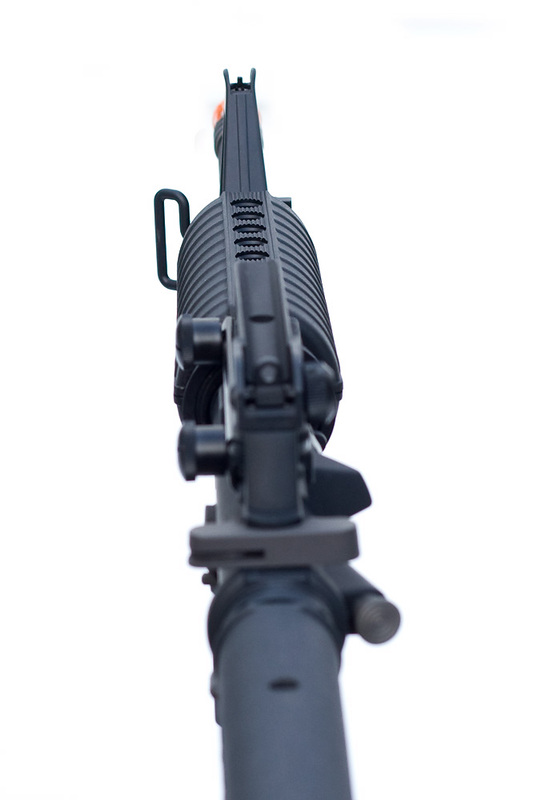 The forward assist button underneath the charging handle is just for looks. 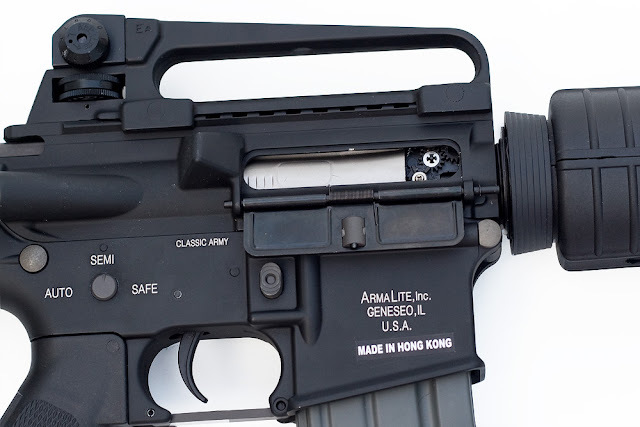 I'd also like to point out there that there is an adjustable iron sight built into the carry handle. Wind-age and elevation can be accounted for. Here's a little bit closer look. 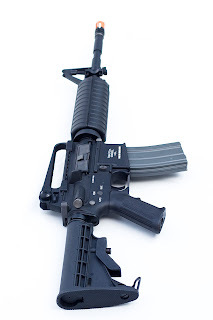 Notice that black ring between the hand guard and the upper? That's the D-Ring and when pulled back towards the receiver, allows the two halfs of the hand guard (top and bottom) to be removed so that you can store your battery inside there. It's pretty limited space. You'll need a small battery like an 8.4v AEG Battery or a 9.6v Nunchuck AEG battery with a low mAh rating in order to fit inside the hand guard. Here's a better look at the hop-up dial. This is another area that CA made some improvements to. In my opinion, they should have completely re-designed the whole thing to use less of those little gears you see, but there is still some improvement over the older models in terms the material they used to make the plastic gears with. When you turn the large adjustment dial at the bottom, the gears turn easier and don't seem nearly as flimsy as the older version. Here's a shot from that has little purpose in this review. However, I chose to include it anyway. Nothing too exciting here, either. 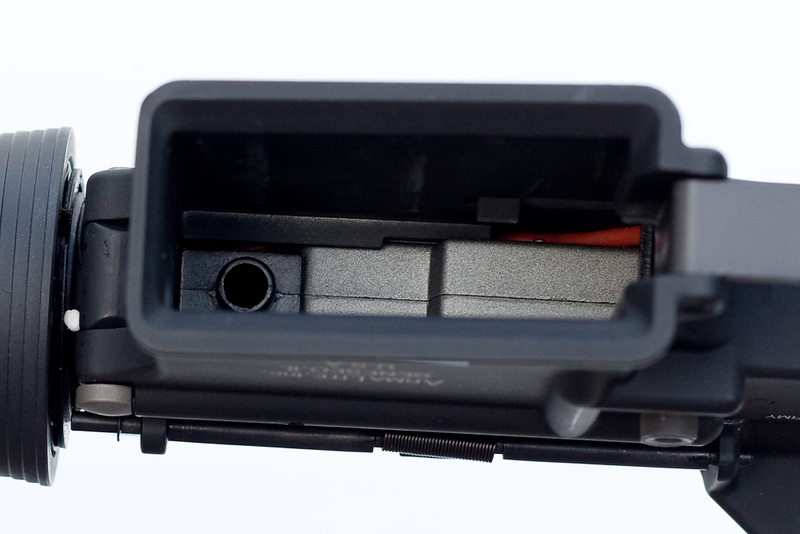 Just a shot inside the magwell with the hop-up chamber's BB entry tube visible, along with the gray metal gearbox. Speaking of the gearbox, let's talk a tick about that. It's a generally-known fact that the M4-style Airsoft AEG rifles utilize the common version 2 gearbox, with Classic Army AEGs being no exception. The CA gearboxes are made to be very sturdy in my experience. I have heavily upgraded several of my Classic Army AEG rifles during my time as an Airsofter with minimal issues dealing with aftermarket upgrade parts compatibility. In fact, I've used a number of different pistons from various brands and only had an issue with using the Guarder gray piston in a Classic Army M14. So I used a JBU piston instead, just like the one in the JBU M120 Tune-Up Kit. I was using a 150 spring, so the aluminum piston was warranted. I'd like to tear open the gearbox at some point soon to illustrate just how nice the internals are, but for now, you'll just have to take my filthy word for it. They are legit. They're not perfect, as no internals are, but they are quite good. I plan to chrono this hot lady and post the results for all the world to see. There's also a disassembly guide on the way as well. Overall, like I said, this is one of my favorite M4-style AEG rifles. It's a highly upgradeable platform, both internally and externally, and is built pretty well, with minimal wobble. My only real cons would be the lack of battery space that is typical of these style AEGs, not just with Classic Army, but with most brands, and the hop-up mechanism (surprise). The hop-up still has a way to go before I think anyone with any shred of dignity declares it to be respectable, however, it's certainly good enough that you can take this baby out to the field and have a super neato time with it. I certainly have on a number of occasions.